Washington (CNN) - The chairman of the Senate Intelligence Committee said a top White House national security official called her Monday night and apologized for not providing Congress with 30 days’ notice, as is required by law, before transferring five Guantanamo detainees in the recent swap for prisoner of war Bowe Bergdahl. 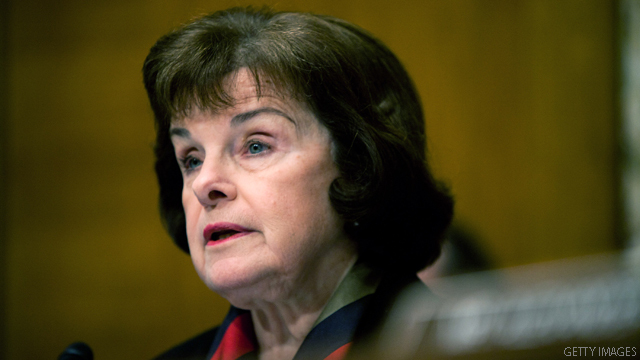 Feinstein said it was her impression from the call that the lack of a notification was an oversight on the part of the White House, although she said Blinken may not have used that exact word. Asked if that Congressional opposition could have been the reason the White House didn’t notify Congress, Feinstein said yes. “Yeah, it could be. But the White House is pretty unilateral about what they want to do when they want to do it. I think the notification to us is important and I think it would have been a much better thing to do because you do try to work together,” she said. House Speaker John Boehner released a statement that touched on the talks from 2011 and 2012 with Congress, saying serious questions were raised to the administration when the possibility of such an exchange was brought up. "Unfortunately, the questions and concerns we had were never satisfactorily answered and they remain today," he said. Boehner said the administration "provided assurances" in late 2011, early 2012 and again in 2013 that talks with Congress over an exchange would resume if the possibility became credible again. "There was every expectation that the administration would re-engage with Congress, as it did before, and the only reason it did not is because the administration knew it faced serious and sober bipartisan concern and opposition," he argued. The speaker added that he supported calls by House Armed Services Committee Chairman Buck McKeon to hold hearings on the issue. the nation-A Mess! Do something! So do you suggest the President should have taken a page from Ronald Reagan's playbook and sold them weapons instead? McCain, when the proof-of-life video of Bergdahl was obtained: "I would support ways of bringing him home," he said at the time. "And if exchange was one of them, I think that would be something I think we should seriously consider." McCain today: "This decision to bring Sgt. Bergdahl home - and we applaud that he is home - is ill-founded. It is a mistake...and it is putting the lives of American servicemen and women at risk and that, to me, is unacceptable to the American people." LOL. They will say ANYTHING they think is advantageous to themselves politically at any given moment. Turdgyl – As a RWNJ poster, you chose an excellent name. 295 million Americans now have insurance with no help from the train wreck party of government shutdown. But ACA is law. That what I said! Just another epic failure from the BIGGEST LIAR OF THE YEAR. Lizzie-the Missile System that you're in love with is a NUCLEAR Deterrent. But, in Repubs. minds, Obama can't kiss his Daughters Good Night in a manner that you'd approve. They apologized because they are on videotape REPEATEDLY assuring people they would follow the law of notifying Congress of any Gitmo prisoner releases. But once again, the Obama administration is proven to be LIARS and in this case law breakers (what's another one after the first 1,000 you break). The problem is Obama is crapping all over DEMOCRATS in Congress as well when he does this stuff. Nothing like saying, you mean nothing to me, I'm a dictator, I dare you to impeach me. And it might be time for just that. Maybe THEN Obama will start taking our laws seriously. Oops, sorry we blatantly broke the law and trades 5 high ranking terrorists for 1 deserter. But the Obama Administration is above the law, so it is okay." The ObamaBots don't care if the President does not follow the Law. Yesterday, the Stock Market hit an All Time Record High. Obama is destroying this Country. The American Military Involvement in Iraq is OVER & we should be down to less that 10,000 Troops in 2015. Obama is destroying this Country. Please get a clue. The missile system is NOT a nuclear deterrent. It is part of a missile defense system to shoot down missiles. Our land, air and sea based nuclear weapons are nuclear deterrents. Someday those on the left will educate themselves before writing in here. Lat month, the American Economy Recoverd ALL Jobs lost in the Great Recession. Obama is destroying this Country. Senator Whinestein should just sit down and shut up and be thankful Obama even knows who she is. She is nothing compared to him. Who cares about notification of the DO-NOTHING incompetent congress . It should be abolished and the GOP members should be thrown in JAIL. Do you actually think these GOP CLOWNS could keep a secret????? Let me get this straight... the party who 'oh so much supports the troops' is lambasting the Commander and Chief of our United States Forces on American soil during a time of War (didn't you morons want to kill the Dixie Chicks for this very same reason) because he saved one of our troops from the enemy in a POW exchange (they are POW's, right? (we do have a War on Terror happening now). Can you imagine trying to get the Congress to agree to this in the short window of opportunity they had... the guy would have died of old age before the House even could decide if the AC should be on 72 or not! Just like I was told during the War criminal years (you know, when the righties that got us into these wars, ignored the threats from Osama bin Laden, invaded two countries who did nothing to us, etc... ) I would tell all you righties if you don't like it then you should just move to Canada, but Canadians have never done anything to me and though I will never forgive them for Justin Bieber, I would not wish our whacko mentally deficient citizens on one of our close neighbors. I still think you all would LOVE Somalia.... no regulations, no government interference, open carry isn't just allowed, but encouraged, and your free markets values exist there much like here... you get to keep all you can steal from those with less power than you. Obama is by far the worst president the US has ever had. He should be impeached for his malfeasance and lawlessness in office. Unfortunately the nation will take decades to recover from the damage he's done, if it recovers at all from his damnable "fundamental transformation" of America he promised and is now delivering - to the nation's detriment. And God help us, we've got 2.5 years left of this incompetent (some would say malevolent) jerk in the White House. This whole mess stinks to no end. There needs to be an investigation into this matter. All the evidence, witnesses, and facts point to Bergdahl going awol. He should face a court martial. ...And he well might. We had to get him home first- we can always find him guilty in due time. Note the conservative split personality. What demon can we imagine today? #1 Obama is a no-nothing inept community organizer clearly out of touch and unable to do anything. #2 Obama is a totally efficient clever dictator who has deceived everyone and pulled off the ultimate cover up. Apologies are not acceptable for breaking the law. What I simply love about your posts, Rick is that they are written as if Ronald Reagan, and G.W. Bush never stepped foot on the Earth- the two biggest war criminals ever in modern American History. And being the law-abiding boy scout that you are, I am sure you support and defend the ACA, since it is law. @Marcus-Have you been watching the news about Bergdahl? What the statements of his fellow soliders? What about his dad`s comments?